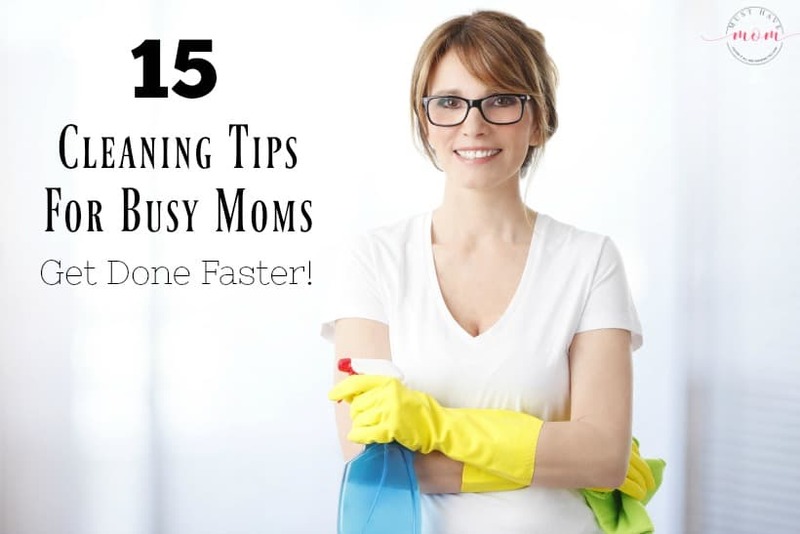 Moms are busy and the last thing we want to do is spend our days cleaning so grab these 15 cleaning tips for busy moms to get it done faster by using a cleaning routine! 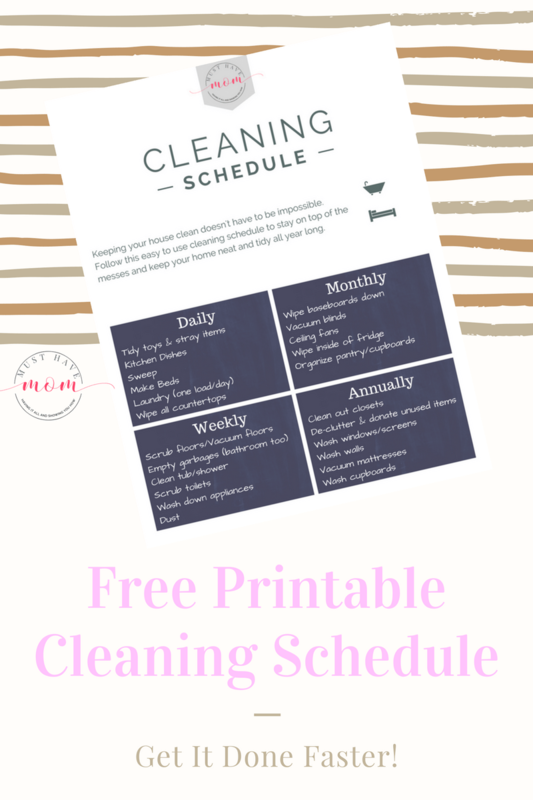 Be sure to grab the free printable cleaning schedule too! Keeping the house clean when you have little ones underfoot can be a huge challenge. It’s like trying to brush your teeth while eating oreos. It is a constant struggle, can you relate? Make your cleaning routine a little bit easier by following a cleaning schedule to stay on top of the messes in a shorter amount of time. Get it done faster and enjoy the time you save! Merry Maids, the nation’s largest home cleaning provider and a ServiceMaster company, is sharing its expert tested, tried-and-true, room-by-room plan of attack. Here are 15 cleaning tips for busy moms to get done faster plus some bonus tips from Merry Maids! 1.) Follow a cleaning routine and repeat each day, week, month and year to stay on top of things that need to be done. Have you ever looked at the ceiling fan and wondered how long it has been since you last dusted it? Or perhaps you’ve wiped the counters twenty-five times but have ignored the appliances. 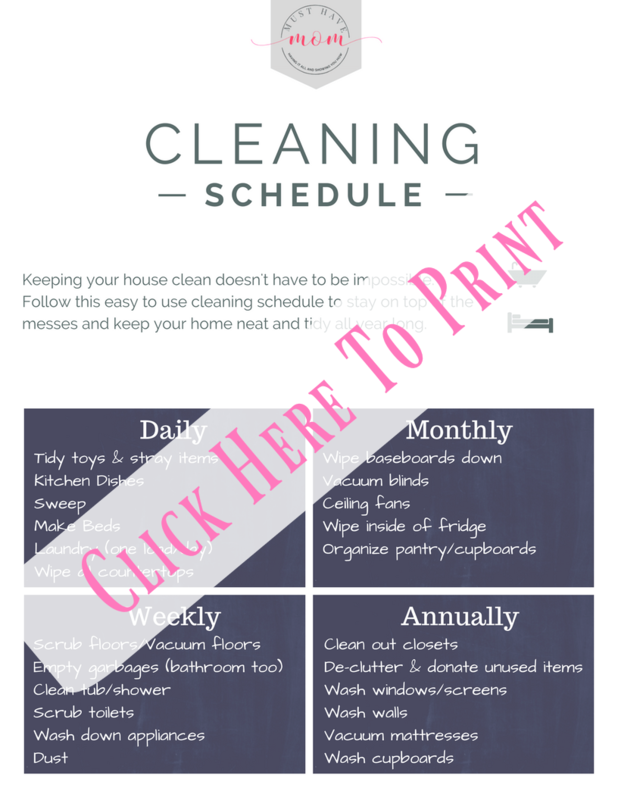 Grab my free printable cleaning schedule to stay on top of the messes and develop a cleaning routine that ensures these things get done efficiently and methodically. 2.) Set times throughout the day to quickly pick up messes and return things to where they belong. Often my kids get started playing legos and then move on to something else. Their attention span can be short and if we wait until the end of the day to clean up all the messes it turns into a huge chore. If we clean up often throughout the day, it only takes a few minutes and we can return to what we were doing. It makes a huge difference by the time bedtime rolls around. 3.) Have a cleaning caddy that you can take room to room with you so you always have the supplies you need close at hand. If you are always having to run to the next room for more supplies then it takes a lot longer to get the job done. 4.) Do one thing at a time in every room. Rather than cleaning each room top to bottom and then moving on to the next room, pick a chore like vacuuming and vacuum all the floors that need it at once. By doing things one task at a time (vacuuming, dusting, washing windows) you can easily speed through the chore and not get distracted by cleaning an entire room. 5.) Don’t waste time hand washing toys or bathtub toys that need to be cleaned. 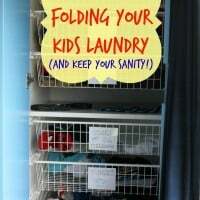 Toss them in a mesh laundry bag and throw them in the washing machine or dishwasher. Did you know you can even toss shoes in the dishwasher? Hats too! *Expert Bonus Tip: Make it your mission to vacuum every piece of dirt and debris off your kitchen floor, from tile grooves to cabinet baseboards. Mop with a battle-tested mixture of one half-cup vinegar to a gallon of warm water for a natural, spotless clean! For extra-stubborn stains, a microfiber cloth and fresh batch of baking soda paste will do the trick. 6.) Include your kids. We often overlook that we have some of the best helpers we could ask for, our children! By requiring them to pitch in with chores it will help them learn to contribute to the family and it will lighten your workload as well. 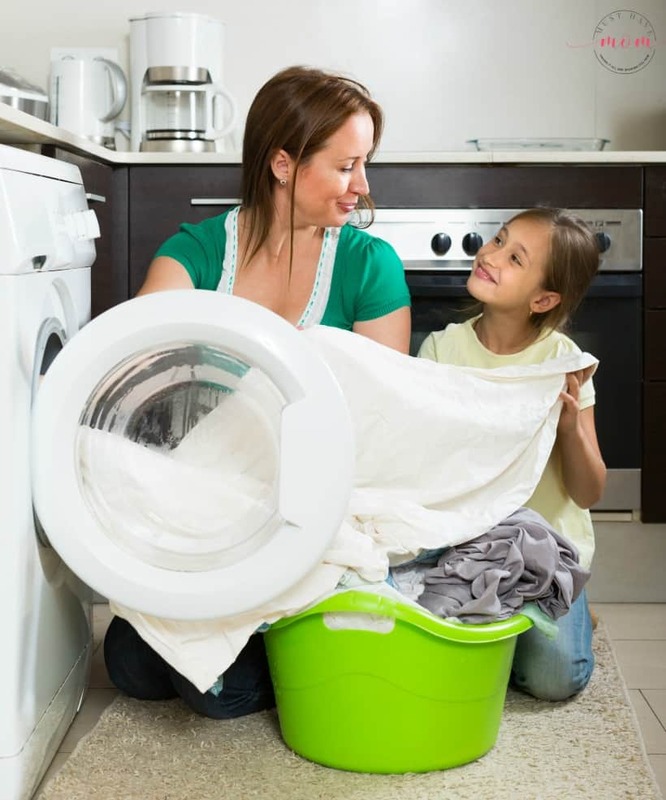 Kids can help with all sorts of chores like emptying the dishwasher and loading it, putting laundry from the washer into the dryer, folding towels, vacuuming, dusting and picking up toys. 7.) Use your vacuum for more than just vacuuming the carpet. I use mine to vacuum all the floors (hardwood included) which is much faster than sweeping. You should also use the tools on your vacuum to remove the dust from vents, curtains, blinds, ceiling fans and baseboards. It saves a load of time and works just as well, if not better than other methods. 8.) Use newspaper to wash your windows. It sounds so odd, but it works the best at leaving a streak-free shine! Use newspaper in place of towels and you’ll be surprised at how well they work. 9.) Eliminate clutter as you clean. When you come across something that you no longer need or use, toss it in a donate bag rather than just moving it to a new spot. By eliminating the extra clutter you make it easier to keep your home neat and tidy. 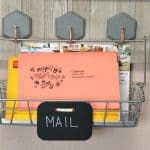 The less stuff you have, the less mess there is to keep organized! 10.) Resist the urge to multi-task. I have what I refer to as cleaning ADD. I’ll start out doing laundry and need to go grab some dirty towels from the bathroom. Before I know it I’m scrubbing the toilet and totally forgot I was in the middle of laundry. Try to stick to one task at a time or it can be easy to dive into another task and never finish what you intended to do in the first place. *Expert Bonus Tip: Three areas are frequently forgotten: doorknobs, the in- and outside of your bathroom vanity and medicine cabinets, and the shower doors or curtains. Scrub fixtures, doorknobs and shower doors and curtains with lemons. Wash vanity drawers or cabinets using warm water and a microfiber cloth. 11.) Delegate! 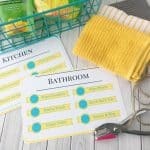 Create chore charts for the kids and ask your hubby to pitch in too. You are one person leading an entire family and everyone should pitch in which will make light work of the household duties. You can even make kids cleaning kits for each room so they can easily tackle their chore. 12.) Give each of your children a basket and have them walk through the house and put everything that is theirs in their basket. Have them return the items to their rightful place in their bedroom. 13.) To help cut down on the messes it is useful to create rules about eating anywhere other than the table. I have a lot fewer spills and crumbs in my house if I require my kids to eat only at the table (and not the living room couch!). 14.) Brush your pets often to cut down on the amount of dog/cat fur that gets left behind. Having lint brushes handy also helps if you have fabric furniture that tends to get full of fur. 15.) Make visitors remove their shoes before walking through your house. You’d be surprised at what lurks on the bottom of shoes and probably disgusted. Cut down on the dirt and mess by having everyone take their shoes off at the door. *Expert bonus tip: Rid your home of pollen, allergens, dust, and dirt by showing TLC to windows and their treatments. Steam clean curtains, take a dryer sheet to mini blinds or wash shades using warm water, soap, and your trusty microfiber cloth. No time for spring cleaning this year? Your local Merry Maids will deep clean room by room for you with this same attention to detail, using the same tools and methods Johnson recommends. To find the nearest Merry Maids location, visit MerryMaids.com. Merry Maids can customize a cleaning plan for your home, ensuring a consistent, reliable and thorough cleaning every time. I clean, but I don’t have a good cleaning routine in place. And I definitely should. These tips are pretty darn fabulous. My favourite is definitely getting the kids to help out! I need a cleaning routine. I am a scatter brain when it comes to cleaning. I start one thing and before I’m done, I move onto something else. Love the tips. Thanks for sharing. I love these! That printable is the best. It’s so easy to forget to clean everything when you’re pressed for time ALL the time. I”m considering hiring a biweekly maid or something. By the time I get the daily stuff done like dishes, trash, petcare, cooking, and wiping things down, it’s a struggle to do the floors (vaccuum, mop, sweep), and bathrooms. I like to clean too, just so little time. That printable is genius! I do all the house chores and cleaning now but it can be hard to keep up with what has and hasn’t been done this week. I clean (cough) when company is coming over, when my allergies are triggered because I haven’t cleaned, or when something starts to smell. As long as the kitchen and bathroom are clean, the rest of the house, I keep hoping that Harry Potter will cast some kind of cleaning spell on. I loathe cleaning house. I love the printable, it’s cute, would it make me clean regularly, nah, probably not, but it is going to take a lot more than a piece of paper for that to happen, laugh. I am not opposed to cleaning, but a cleaning schedule is always helpful. I love that you have a room by room guide. That is great! I love the idea of having a routine. That is exactly what I need. A list of every day chores and weekly chores would be a nice reminder. This is Amazing!!!! 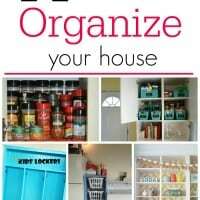 I love your tips on how to clean and keep a tidy home. Life can get so crazy busy and finding easier ways to clean up is helpful. A cleaning routine is a fabulous idea. I tend to start cleaning with whatever I happen to notice, instead of being systematic and organized. A routine like this would probably result in a cleaner house with less effort on my part! I am always looking for ways to make cleaning easier. I will have to print off one of these. It is a great idea. #1 is exactly my problem. I don’t have a routine. I have cleaning so I just clean stuff as I see it. I need to get some Merry Maids. These are some great helpful tip. I need a cleaning routine.